_Furry, cuddly Cherry the Cat is so huggable, you'll want her on your lap all day long! Cherry is the new girl from Emotion Pets, and she's a real beauty. 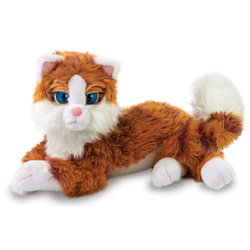 We first saw her reclining on a cushion at the London Toy Fair as any diva cat should do, meowing gently, blinking in the spotlights and gently wiggling her ears. Stroke Cherry's ultra-soft furry back and she'll swish her tail and purr in deep contentment. Feed her a fish biscuit and she'll 'chew' it with realistic sounds, but he knows when she's eaten enough- if she's not hungry, she'll not eat it! However, she's a bit of a scaredy-cat too; she trembles at loud noises, so pick her up, give her a cuddle and she'll fall asleep and snore gently in your arms. Unlike many other reactive toys, Cherry is soft and flexible, so she's fun to cuddle, and her random play feature ensures you'll never quite know what she's going to do next! Hear Cherry meow, purr and snore! Like this Christmas toy for a girl but want something smaller? How about a FurReal Cookie Puppy instead?